Fact: If you're creating meals out of beans or lentils as your main source of protein, and sticking with mostly plants and whole grains, then theMediterranean diet is less expensive than serving dishes of meat, cheese, and processed foods. Myth 2: If one glass of wine is good for your heart, than three glasses is three times as healthy. Fact: Typically, Mediterraneans don't eat a heaping plate of pasta the way Americans do. Instead, pasta is usually a side dish with about a 1/2-cup to 1-cup serving size. The rest of their plate consists of salads, vegetables, a small portion of meat, and perhaps one slice of bread. Fact: Those living on Greek islands don’t enjoy good cardiovascular health just by eating differently; they walk up and down steep hills to tend to their garden and animals, often living off what they can grow themselves. Physical labor plays a large role. 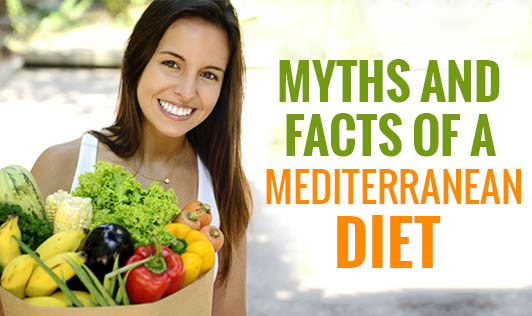 Fact: The food is a huge part of the diet, yes, but don't overlook the other ways the Mediterraneans life their lives. When they sit down for a meal, they don't sit in front of a television or eat in a rush; they sit down for a relaxed, leisurely meal with others, which may be just as important for your health as what's on your plate.